Here are the best and recommended Canon EOS 5D Mark IV Lenses. Popular mid-range full-frame digital SLR camera announced back in August, 2016. Recommended Canon EOS 5D Mark IV lenses are categorized below as standard prime lenses, standard zoom lenses, wide-angle prime lenses, wide-angle zoom lenses, telephoto zoom lenses and macro lenses. You can also find some recommendations for the wedding photography, landscape photography, sports photography sections. 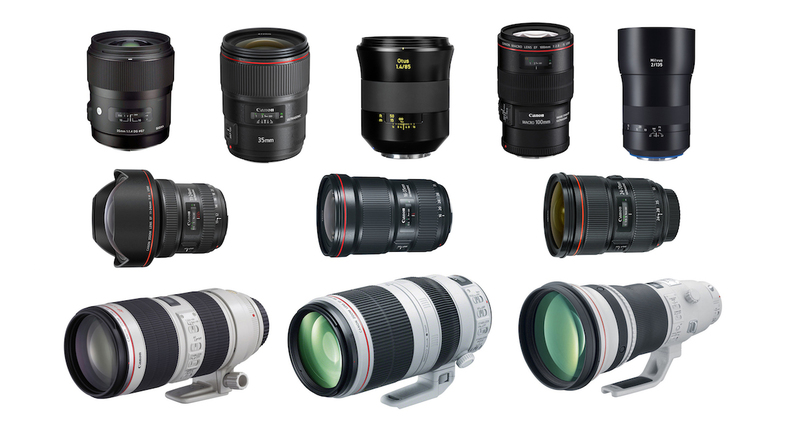 Here are the best 5D Mark IV lenses to choose for. Additionally, Canon EOS 5D Mark IV features a 30.4 megapixel CMOS sensor with Dual Pixel AF. It significantly extends the still and video capabilities the series has become known for. The camera’s AF coverage, sensitivity and lens compatibility has been expanded in-line with the EOS-1D X Mark II. The maximum frame rate boosted to seven frames per second. The 30-megapixel CMOS sensor allows for fast phase-detection autofocus in video and continuous focus for stills shooting in live view. Video can be captured in the DCI (4096 x 2160) 4K format at up to 30p. It’s up to 60p in 1080, and 120p in 720. 4K video is captured in the high quality but inefficient Motion JPEG format. See Canon EOS 5D Mark IV additional coverage with sensor test results. Canon EF 24-105mm f/4L IS II USM ($1,099): The EF 24-105mm f/4L IS II USM is ideal for landscapes, portraits, sports and more, offering effective all-day performance for advanced photography and videography. It features a zoom range of 24-105mm and a constant f/4 aperture. Canon 24-70mm f/4L IS USM($899): With 2 aspheric and 2 UD elements, the EF 24-70mm f/4L IS USM can deliver high-quality images with excellent detail throughout the entire zoom range. Inner focusing and ring-type USM deliver, fast, quiet AF, and full-time manual focus is available for manual focusing even while in AF mode. Sigma 50mm f/1.4 DG HSM Art ($949): The Sigma 50mm F1.4 DG HSM Art is a pro-level performer for full-frame DSLRs. It is ideal for many types of videography and photography, including portraits, landscapes, studio work and still-life. Canon EF 40mm f/2.8 STM ($199): The EF 40mm F2.8 STM offers excellent image quality in a tiny, well-made package. For APS-C users it provides a great carry-everywhere complement to a kit zoom, and for full frame shooters it’s an excellent general-purpose ‘normal’ lens. Canon EF 50mm f/1.2L USM ($1,349): Excellent! It’s sharp all the way and has great performing in low light condition. The EF 50mm f/1.2L USM lens is now the fastest autofocus lens in its class, which makes it an essential tool for many professional and advanced amateur photographers. Canon EF 50mm f/1.4 USM ($349): This lens delivers a significantly better optical performance than all but the most extensive zooms, in a small, light and relatively inexpensive package. Standard lens featuring superb quality and portability. Canon EF 50mm f/1.8 STM Lens ($125): Great budget-fridnley lens! Compact, lightweight fixed focal length optic is ideal for everyday photos. Canon EF 24-70mm f/2.8L II USM ($1,799): Perfet lens covers from landscapes to portraits, extremely sharp, and has fast, silent and accurate autofocus. The Canon EF 24-70mm f/2.8L II USM gets 87% overall score and Gold Award at DPReview. It is suggested for professional and serious enthusiast photographers looking for the best possible optics in an ‘everyday’ standard zoom lens. Sigma 24-35mm f/2 DG HSM Art ($999): The Sigma 24-35mm f/2 DG HSM Art lens is the world’s first full frame F2 zoom lens. It incorporates the latest Sigma technology, including an optimized autofocus (AF) algorithm for smooth, fast, and accurate focusing, as well as manual focus (MF) override functionality. It’s ideal for close-up shooting, portraits and deep-focus landscape photography. Tamron SP 24-70mm f/2.8 DI VC USD ($1,299): This is the first fast standard zoom for full frame cameras to feature optical image stabilization. Its combination of impressive optics, effective autofocus and image stabilization systems, and drip-proof construction makes it a compelling alternative to the much more expensive offerings from Canon, Nikon and Sony. Canon EF 14mm f/2.8L II USM ($2,099): This lens is the ideal choice for architectural, wedding, or other pro-level photography applications. A maximum aperture of f/2.8 allows photographers to shoot hand-held in low-light conditions without worrying about blur from camera shake. Zeiss Milvus 21mm f/2.8 ZE ($1,843): The ZEISS Milvus 2.8/21 super wide-angle lens of the type ZEISS Distagon is the best in its class. The Zeiss Milvus 21mm f/2.8 is extremely sharp all the way to the corners and has almost no distortion. Great choice for many professional photographers. Canon TS-E 17mm f/4L Tilt-Shift Lens ($2,149): It is the widest tilt-shift lens in the Canon lineup. Very sharp edge to edge even wide open. Virtually no flare. This is ideal for ultra wide-angle applications including architecture, landscape and product photography. Canon EF 24mm f/1.4L II USM ($1,549): The EF 24mm f/1.4L II is ideal for photojournalists, landscape and event photographers, and anyone who enjoys taking images from a wider perspective. Fast and accurate auto-focus, Nice bokeh, Rugged, Strong construction, Superior build quality and Super-sharp images! Canon EF 11-24mm f/4L USM ($2,899): This is an ideal lens for landscapes, interior shots and unique perspectives on subjects close and far. Its new optical design features Super UD and UD lenses that correct chromatic aberration. Tamron SP 15-30mm f/2.8 Di VC USD ($1,199): Tamron SP 15-30mm f/2.8 Di VC USD ia really an attractive, more affordable alternative to similar wide-angle zoom lenses from Canon and Nikon. It’s much cheaper than Canon EF 11-24mm f/4L USM. Canon EF 16-35mm f/2.8L II USM ($1,499): The EF 16-35mm f/2.8L II USM is a high performance, water-resistant, and ultra wide-angle Canon L-series lens. It has been specifically designed for improved edge-to-edge image quality that will meet the strict requirements of professional and high-end amateur photographers. It’s extremely sharp, impressive in low light and focuses quickly in most circumstances. Canon EF 16-35mm f/4L IS USM ($999): The f/4 version is also a great ultra-wide angle lens offering high performance in a compact design. It is sharp all the way to the corners for landscapes and other wide-angle shots. And the f/4 version has the stellar-performing image stabilization system. Canon EF 17-40mm f/4L USM ($749): Do you want to save money for a wide angle lens. This lens is sharp, precise focused, and covers a variety of focal lengths for landscapes and other wide-angle photography. The biggest downsides of the Canon 17-40mm are its maximum aperture of f/4 and no image stabilization. Canon EF 100-400mm f/4.5-5.6L IS II USM ($2,099): Five star lens features one fluorite and one super UD element to help provide impressive contrast and resolution with reduced chromatic aberration across the entire zoom range. If you can afford, get it right now! Canon EF 70-300mm f/4-5.6L IS USM ($1,349): Canon EF 70-300 f/4-5.6L IS USM telephoto zoom lens brings a favorite zoom range to the celebrated Canon L-series of lenses. If you frequently shoot in low light condition, you can consider the Canon 70-200mm f/2.8. It is suitable for nature, landscape, sports and travel photography. Sigma 150-600mm f/5-6.3 DG OS HSM Sports ($1,999): The Sigma 150-600mm 5-6.3 DG HSM OS Sports lens is the new standard for telephoto zooms. Boasting 2 FLD glass elements (performance equal to fluorite) and 3 SLD glass elements, the new Sport lens produces incredibly sharp images through the entire zoom range. Canon EF 200-400mm f/4L IS USM Lens with 1.4x Extender ($10,999): The Canon EF 200-400mm f/4L IS USM Extender 1.4x is a high-performance super telephoto zoom lens with an optically matched built-in 1.4x extender for maximum versatility. Canon EF 100mm f/2.8 Macro USM ($599): Ideal for photographing details and small subject material, it also serves as a very sharp prime telephoto lens for portraiture and other applications. It provides a combination of versatility, image quality and superb handling.